Of Mice & Men have been forced to cancel the start of their upcoming tour with Beartooth. 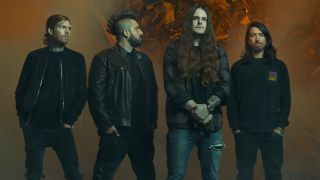 It’s now emerged that it was an emergency affecting vocalist and bassist Aaron Pauley, who’s had surgery and is now recovering, leading to the cancellation of some of their upcoming shows. Of Mice & Men say in a statement: “On Monday, April 8, Aaron became aware of a medical issue requiring immediate surgery. “The surgery was performed yesterday without incident and the issue is currently being evaluated. He has been advised that the absolute minimum recovery time is two weeks from today. “Therefore, we’re sorry to report that we have no choice but to cancel the start of our dates with Beartooth. Find a list of the affected dates below. Last month, Of Mice & Men released a video for their single How To Survive and announced a European headline tour that’ll take place throughout August.